The engine driven system is by far the most widely used system in the aircraft market place because it uses the power of the engine to drive the compressor. This technology is what has been used in the engineering of automobiles for over 60 years. The advantage of a system driven by the engine is that you add very little weight for a drive unit and with as little as a 4-5 horsepower draw on engine. Most electrical systems require only 12 volts and less than 30 amps to lock in the compressor clutch and exhaust the heat exchangers. Depending on the compressor, many are capable of providing 18,000 BTU's at less than 2500 RPM. By far the best choice for the price conscience and those with available space. The disadvantages of this type of system is that you must mount this unit to a drive from the motor, most of which would be the prop shaft and others may use an auxillary drive on a piston engine, or on a drive pad on a turbine. 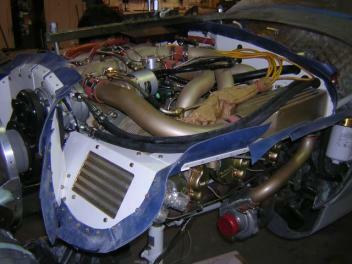 On a rear mounted sytem the biggest problem is space to mount a compressor under the cowling and away from the firewall. On a pad mounted turbine or pad mounted connection your biggest concern has to be sheer strength of the drive shaft linkage. If you calculate and install the wrong drive shaft or linkage and have a compressor failure, you will do very expensive damage to the back of your motor (at the least), if your lucky enough to be able to land in one piece. Flightline AC, Inc. takes into consideration every type of mount in the developement of a system for each specific aircraft. Flightline's drive and mounts are made from the most durable billet and steel. Our compressors all drive with the minimal draw of horsepower, yet deliver the highest BTU exchange. Clutch and drive plate designs are all heavy duty and have proven to last for years on aircraft with 1000's of hours of usage and no known failures.